Experience one of Australia’s newest forms of construction – straw bale building – at Ganmain’s Huff ‘n’ Puff Constructions. Straw Bale and Historic Heritage Housing Tours are now being offered in Ganmain! The tours explain the recent history of this unique, sustainable method of construction and how it is being used in modern-day architecture. Your hosts, John and Susan, will explain the recent history of straw bale construction and how they introduced straw bale building technology to Australia in 1997. Since 1997 Huff ‘n’ Puff Constructions have built homes, wineries, community centres and school halls using straw bales. 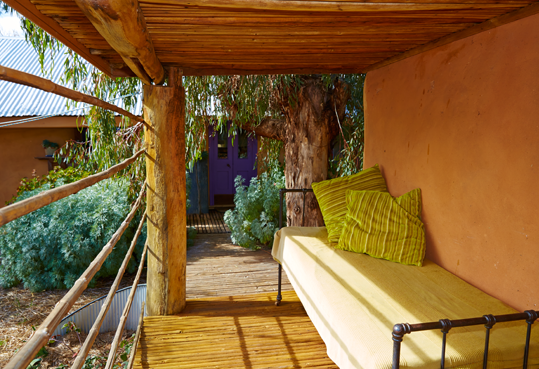 Many suggest the highlight of the day is visiting the straw bale home, where visitors are guided through the seven pavilions of John and Susan’s home, made entirely from straw bales (as seen on Channel 7’s Better Homes and Gardens program). Learn how the home was constructed using load bearing straw bales, earthen floors, lime and earthen renders, alternative foundations and super insulation. You will also view the Rondarval and its African display. Look forward to seeing the colours and delight’s of Susan’s permaculture gardens as you walk to the straw bale making demonstration where John will show you the materials and techniques used in straw bales and the technology used in the craft. The tours are suited to people of all ages and involves walking some short distances. It is suitable for people of all abilities and is accessible for prams. At present, tours are only available to groups and can be customised to suit your groups interests and needs. All tours include lunch and light refreshments. The visit includes a look at the history of the development of Huff ‘n’ Puff Constructions and how Susan and John relocated and rebuilt many derelict, yet historic homesteads. View the image display of the homesteads and woolsheds that they have moved from the Riverina and rebuilt on the East coast of Australia, saving these important pieces of history from demolition.